Best DM? Wow, they’ve saved the hardest for last! 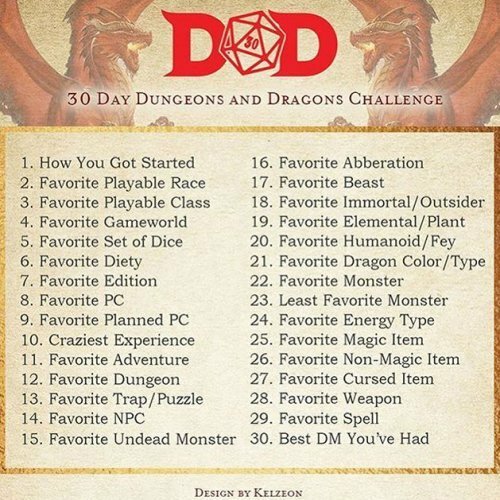 I’m been roleplaying for almost 35 years and have played with a large number of DMs. If I include convention DMs we could be looking in the hundreds! I’m not going to pick a single DM though. Because I can’t. Too many of those DMs have been excellent for me to pick one out above the others. What I am going to do though is highlight some of the DMs that have run games for me over the years. Sean: Sean was my first DM. Without Sean I probably wouldn’t be here now. He introduced me to AD&D 1st Edition when I was still playing with the Red Box Basic Set and also a number of other TSR games (including one, Top Secret/S.I., that lead to the creation of my espionage RPG website almost 20 years ago). John: John ran a great AD&D 2nd Edition campaign using his homebrew world. It contained one of my favourite PCs (Wulfgar Tannerson) and I loved the character development that John encouraged. John: Another John, this one I introduced to the Living Greyhawk campaign and, in return, he introduced me to gritty urban fantasy campaigns. He could put together a scenario on the “back of a fag packet” that would have the group entertained for a number of sessions. Corey: Corey is my current DM. He may even read these entries! I love his NPCs and general enthusiasm for the game. I met Corey during my absence from D&D during 4th Edition’s days. He helped me to recover my love of D&D-helped by the release of 5th Edition. If I was forced to pick a “Best DM” though, it would be the one running the game at the moment. Because without them, I wouldn’t be playing. Tags: 5th EditionLiving GreyhawkRed BoxTop Secret/S.I.